Before heading home from our fun fall weekend getaway, my husband and I headed over to a local apple orchard to buy some delicious Honey Crisp Apples. My husband had grown up going to this orchard as a family to buy apples, fresh apple cider slushy’s, and hot fried apple pies, so going there brought back many found memories for him. I also have some found memories of going to local apple orchards as a child. I had several really fun teachers growing up that took us to apple orchards in the fall on field trips. I mean what could be more fun than to get out of class to go on a fun fall field trip to pick apples? 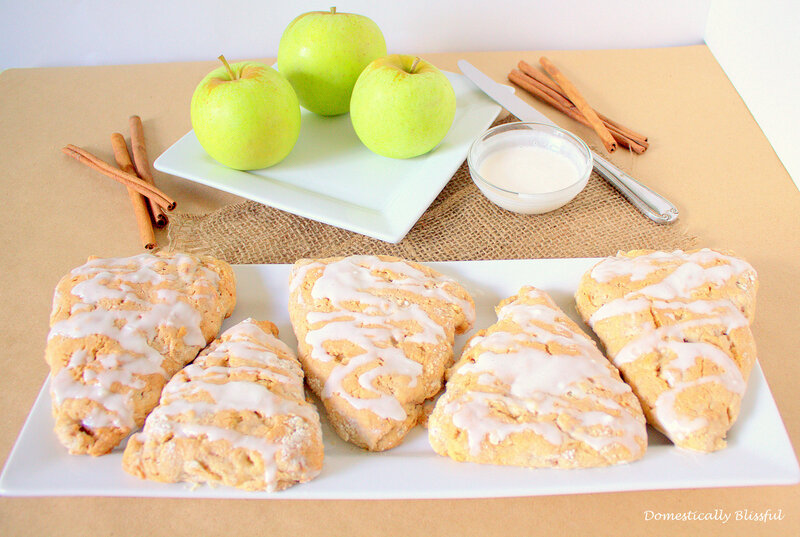 So although I had originally been planning on making pumpkin scones – to use up the pure pumpkin I had left over from making these Spiced Pumpkin Donut Holes – I decided to go with an Apple Cinnamon Scones recipe instead. And I am really glad I did because these are delicious! 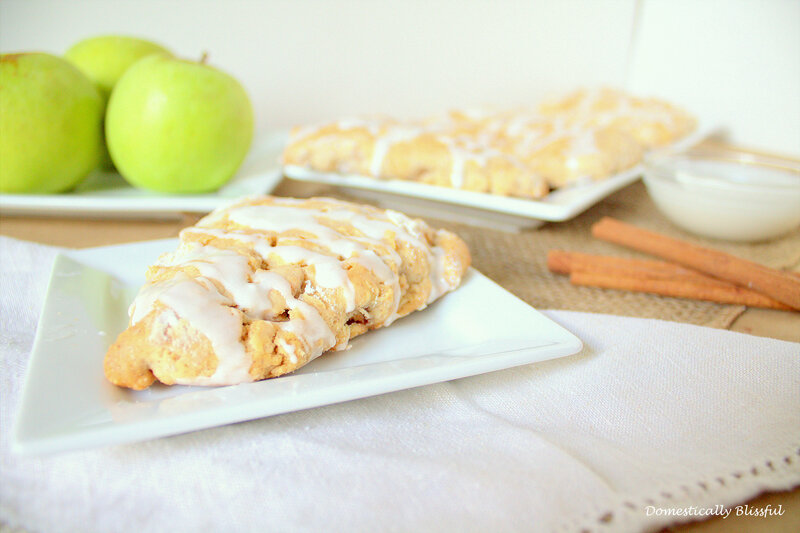 I made these Fresh Apple Cinnamon Scones days ago and I am still enjoying them by popping them in the oven at 350 to warm them up. Seriously so good! Like fall in your mouth! First, skin and dice one large apple. At medium heat melt the butter and cook the apples until tender about 4-5 minutes, then mix in 1 teaspoon cinnamon and set to the side to cool – if you want the apples to cool faster remove them from the hot pan. In a bowl sift together all of the dry ingredients – 2 and 3/4 cups flour, 2 teaspoons baking powder, 1 pinch of salt, ¼ cup sugar, and 1 ½ teaspoon cinnamon. Next, use your fingers to crumble the 1 stick of butter into the dry ingredients, the butter pieces should be about the size of peas and evenly dispersed throughout the dry ingredients. It is important to work fast to ensure that the butter stays cold – I like to place my butter in the freezer when I start this recipe to ensure that it is extra cold for this step. 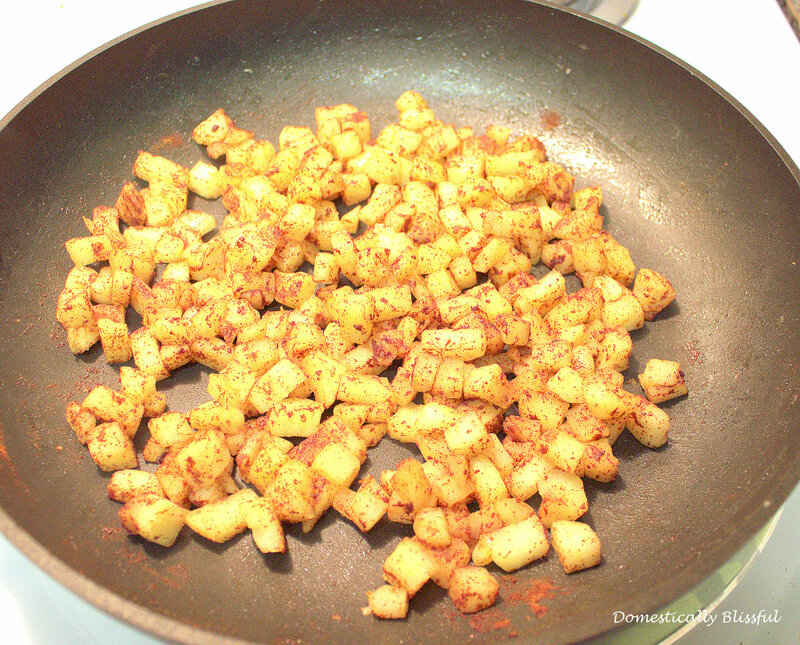 Once the butter is evenly dispersed, fold in the apple spice pieces. Make a well in the center of the dry ingredients and pour in the ½ cup of half and half and ½ cup of French Vanilla Creamer. 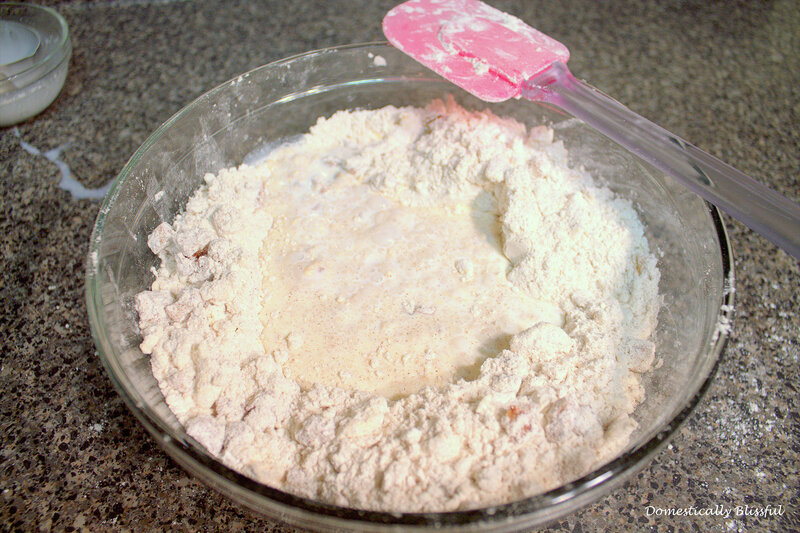 If the dough seems too wet or sticky, add more flour a tablespoon at a time. If you have extra time, I like to place my scone dough in the freezer for 30-45 minutes to make sure the butter is extra cold. Then preheat your oven to 400°F. If not skip to the next step. 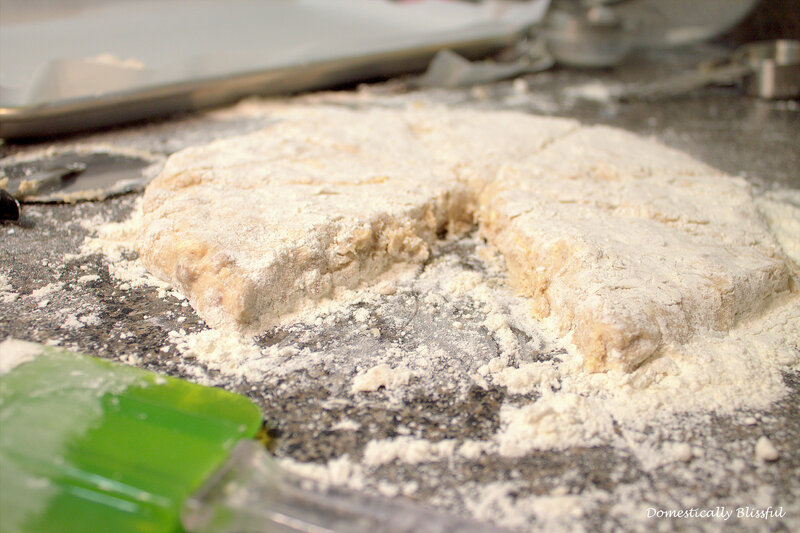 Place the dough on a well floured surface – I also sprinkle some extra flour on top of the dough, shape the dough with your hands, and cut according to how large you want your scones to be. 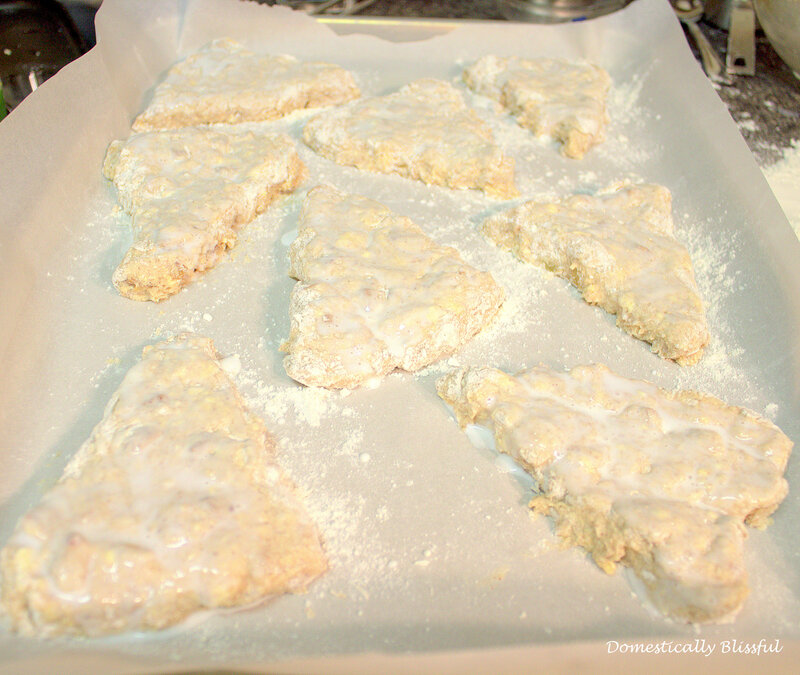 I used all of the dough in the shape of a pizza making 8 gigantic scones, but I could have – should have – spilt the dough in half and made 12 scones. Although the benefit of making gigantic scones is that you don’t have the guilt of reaching for a second scone since the first one was plenty satisfying! Place the scones on a piece of parchment paper and brush each scone with a little bit of French Vanilla Creamer. Bake for about 20-25 minutes until golden brown then set to the side to cool. While the scones are cooling, mix together ¾ cup powdered sugar and 2-3 tablespoons French Vanilla creamer to make the icing. If the icing is too thick add more French Vanilla Creamer if it is too thin add more powdered sugar. If you are a huge fan of cinnamon you could always add a hint of cinnamon to the icing as well! Once the scones are cooled, drizzle on some icing and enjoy! 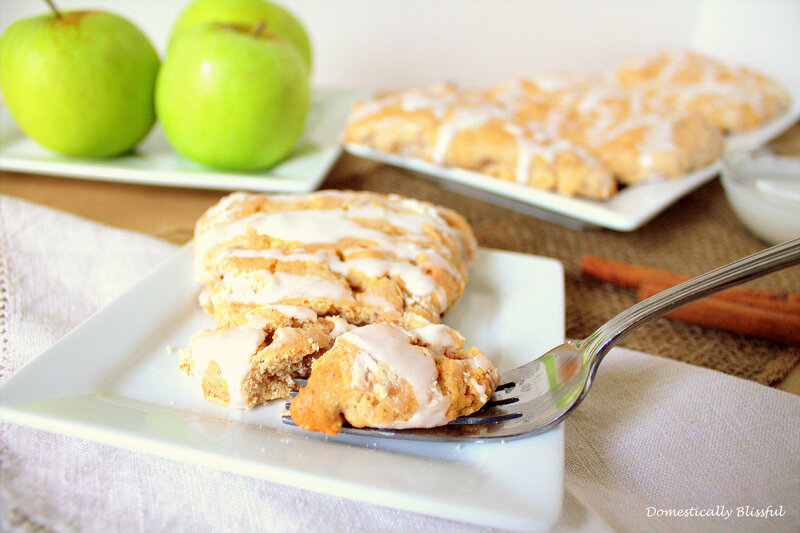 If you enjoyed these Fresh Apple Cinnamon Scones you should also try this Apple Cinnamon Coffee Cake! Or for another festive scones recipe check out these White Chocolate Strawberry Scones for Valentine’s Day! 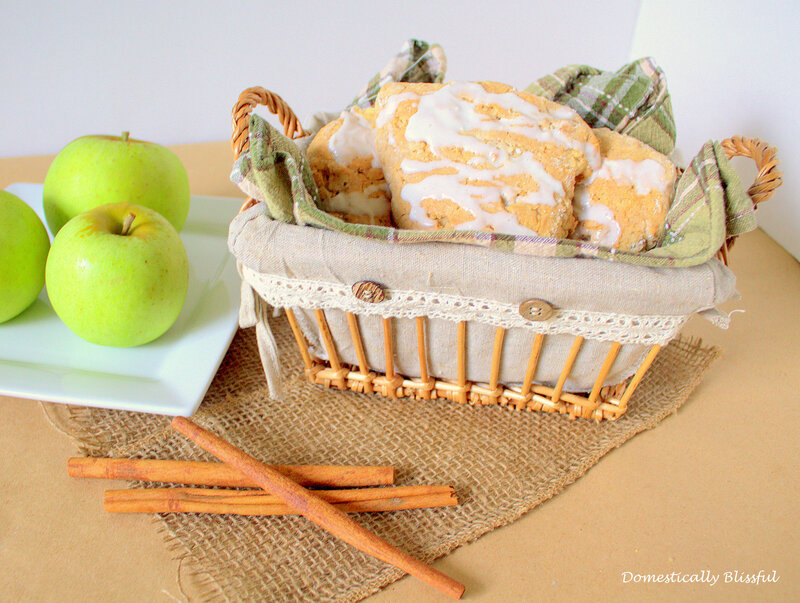 I’d love to see your Fresh Apple Cinnamon Scones! Instagram your yummy fall treats with the hashtag #DomesticallyBlissful and you might find your picture featured on DB’s Instagram! First, preheat oven to 400°F, then skin and dice one large apple. At medium heat melt the butter and cook the apples until tender about 4-5 minutes, then mix in 1 teaspoon cinnamon and set to the side to cool. 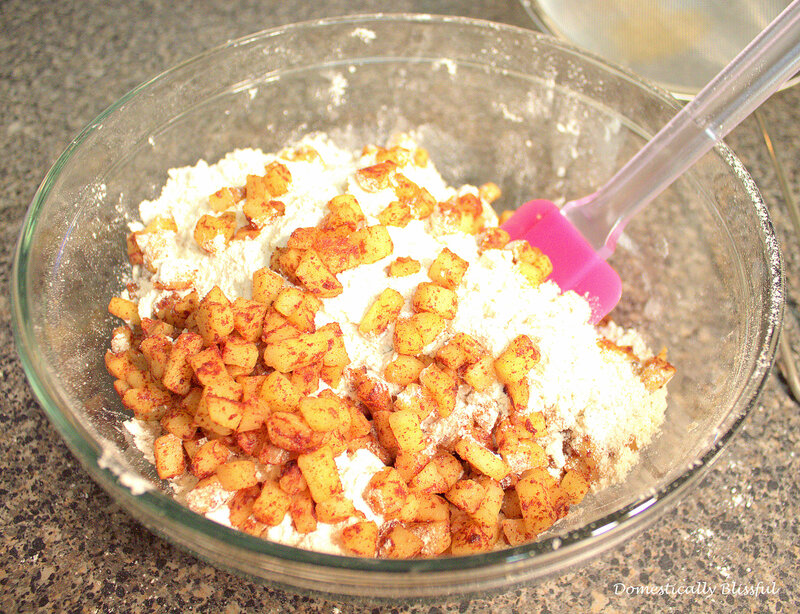 In a bowl sift together all of the dry ingredients – 2 cups flour, 2 teaspoons baking powder, 1 pinch of salt, ¼ cup sugar, and 1 ½ teaspoon cinnamon. Next, use your fingers to crumble the 1 stick of butter into the dry ingredients, the butter pieces should be about the size of peas and evenly dispersed throughout the dry ingredients. It is important to work fast when working with the butter to ensure that the butter stays cold – I like to place my butter in the freezer when I start this recipe to ensure that it is extra cold for this step. I don’t know WHAT I did wrong but my dough was a STICKY mess I had to add at least one and a half cups more of flour to the dough.I have not TASTED them yet . Oh no! That’s so sad! This is my favorite go-to scone recipe & it’s always a HUGE bummer when a recipe you were looking forward to doesn’t work out! I have no idea what could have gone wrong. 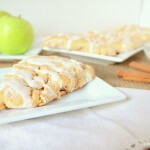 Could the apples have been so juicy they added too much moisture to the dough? 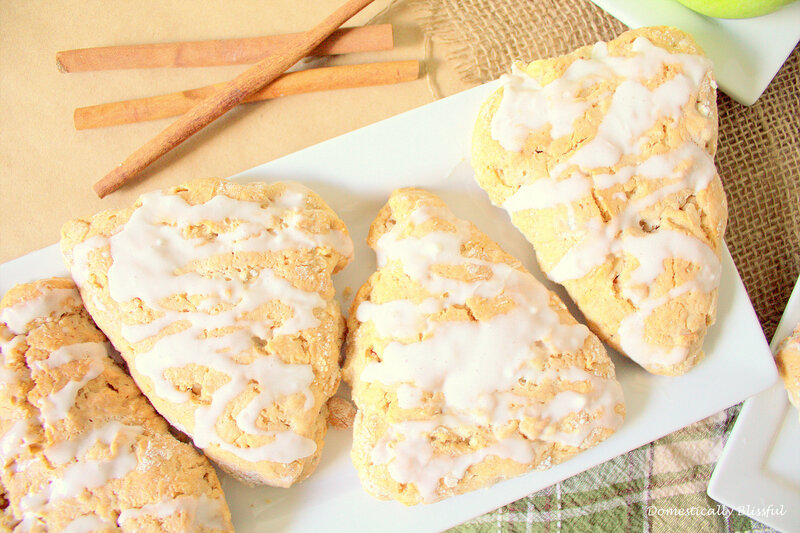 I hope you get a chance to try this recipe again, this is one of my most popular scone recipes & one of my favorite fall recipes. Hope you have a blissful week! these look so amazing!! must try ASAP!